When Nārada told the king that his son was returning, the kind could not believe it. “How can a bad person like me get such good fortune?” He thought it was like hearing that someone was coming back from death. But how could he not believe Nārada, the sage of gods? So, he became overwhelmed with eager joy. In great delight he gave an extremely valuable pearl necklace to Nārada. He rushed out to meet his son, on his best gold-decorated chariot, yoked to his finest horses, surrounded by the wise, the elders, the ministers, and family. Conches and drums resounded, along with flutes and mantras, as the procession left the city. 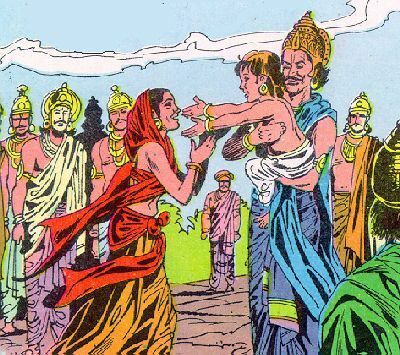 The king had lovingly escorted Dhruva’s mother Sunīti into her own palanquin, and she escorted her co-wife Surci and her son Uttama to sit by her side. The queens were beautifully ornamented in golden jewelry. Seeing his son coming towards them from a nearby grove, the king quickly got off his chariot and ran towards the boy, overwhelmed with love. He embraced the child in his arms for a long time, sighing with a thrilled heart. He noticed that the boy was very different, for all fetters of impurity had been vanquished when he touched Viṣṇu’s feet. The king kept his nose in Dhruva’s hair, while a shower of cold tears from his eyes bathed his son. The king’s most cherished desire had been fulfilled. Dhruva respected his father’s feet and received his flood of benedictions and questions. Then he bowed his head to his two mothers. He retained no hatred for Suruci, because he was the best of the civilized, spiritual people. Sunīti fainted, while Suruci picked up the little boy at her feet and embraced him. Her voice was choked with tears as she stammered a blessing, “Jīva” (trying to say ciran jīva, “live long”). Although she had embarrassingly lost her hold on the king as a result of this boy, still she couldn’t help express her affectionate respects to Dhruva. Water automatically flows downward, and it is just as natural and automatic to feel respect and friendship towards anyone who is respected and befriended by All-Attractive Hari. When the brothers, Uttama and Dhruva, saw one another, they became overwhelmed with love, and embraced one another over and over again as they shed downpours of tears with hairs standing on end. When Sunīti embraced her child, her boy who was far dearer to her than breath, the touch of his body freed her at last from all her worries. The mother of that hero bathed him in the auspicious water of her tears and the milk that flowed from her breasts. As the people expressed their joyful praises, the King placed Dhruva with his brother atop an elephant, and they all returned to the city amidst delightful celebration.